Despite being obsolete now, the JVC DLA-HD1 projector provided the perfect balance between production quality and technical performance. Designed for domestic or general consumer use, it had some of the greatest technical performance of its time. For those who are more demanding when it comes to image quality, this machine offers 15 000:1 native contrast ratio. This is a measurement of image quality that indicates the depth of the image, the astonishing sharpness and the rich colour nuances. This means that the device is capable of generating visual images with even sharper and richer contrast. The image quality of this accessory is heightened further by the use of Direct-Drive Image Light Amplifier (D-ILA). A new and innovative technology that brands such as JVC have integrated into this range of devices. It uses three matrices based on the primary colours which multiplies the capacity by three. Thus, the image is as close to reality as possible. In order to guarantee maximum efficiency, with a VXP 10 bit Gennum processor, the machine is capable of improved performance to calibrate the stream source using the matrix. It is currently the most advanced system available when it comes to light management. The video projector has an integrated polarizing lens with wired mesh suitable for the JVC DLA-HD1 lamp , using high pressure mercury with 700 lumens of power and an average lifetime of 1000 hours. The colours will be even sharper and more varied. Moreover, the flap on the side of the machine gives easy access to replace this component. All you need is a simple screwdriver and a few minutes to replace the projector lamp . In general, the projector is easy to manipulate. The connectivity ports have been limited so as not to clutter the rear of the machine. However, the basics, such as S-video, le HDMI 1, le HDMI 2… are available. The results will be even more amazing with interactive white boards. In any event, this device delivers a full HD 1920 x1080 image resolution. Aesthetically, the JVC brand always makes a point of bringing beauty to their products. This DLA-HD1 model contrasts metallic grey and deep black. Design and a solid appearance, sound quality is ensured through two outputs on the front. For more exacting users, the noise of the device is on average around 25 dB. Energy consumption is limited to 280 watts when in use. Finally, with technological progress in terms of display, other JVC models have been brought out to replace the DLA-HD1 and to better meet the needs of home cinema fans. 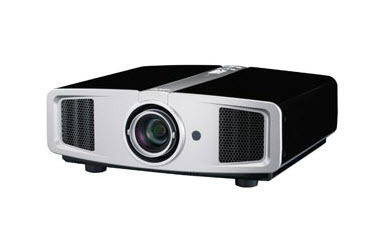 For example, the new JVC projectors, such as the JVC LX-UH1, the DLA-X7900 and the D-LA X9900 all have 4K resolution, 2000 lumens of brightness and contrast ratios of up to 160 000:1.